Acrylic Note Holders Custom Laser Shaped and Custom Printed in Bulk. Holds 3" x 3" sheets. Promotional, Inexpensive. Budget Prices in the USA and Canada. 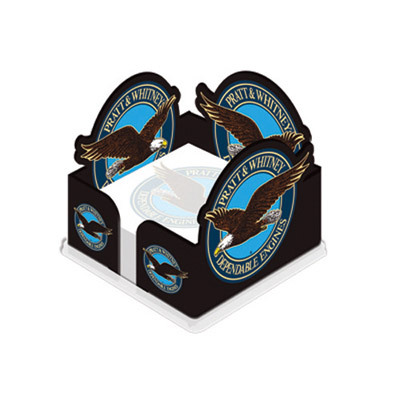 Wholesale advertising Acrylic Note Holders with Free CustomShape. Our laser custom shaped note holder holds 100, 300 or 600 non-adhesive 3" x 3" sheets (see Price Table). Free 1-2 color sheet imprint for a quantity of 250 or more. Free Full Color side imprint, in and outside the holder. It includes free 1 to 4 side designs. Refills available. Clear bottom cap will be used if not specified. Lowest cost in North America. American Clients pay no taxes. The unit prices below include your free custom shape, free full color custom imprint on holder, and free 1-2 color sheet imprint for quantities of 250 or more..
• Custom shaped Note Holder. • 1-2 color sheet imprint (Qty. 250+). • 1-4 side designs, full color side imprint. •Recycled paper available. Call for quote. Side imprint: 1-4cp on clear acrylic, imprint outside and inside of holder. Standard stock: 60 lb. Titanium White. Sheet size: 3" x 3". Sheet imprint area: 2 7/8" x 2 7/8". Sheets: non-adhesive note paper filler. Bottom cap choice of: Clear, black or white. Clear bottom cap is standard. Clear bottom cap is used if bottom cap color choice is not specified on purchase order.